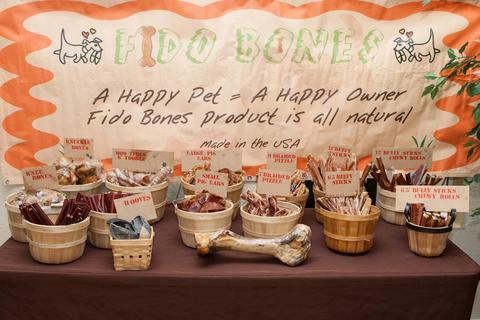 Fido Bones was founded out of a love of animals and that love can be found in everyone of their products. Providing pet owners in the Santa Clarita Valley and beyond with a wide catalog of some of the best and healthiest treats for our four legged family members. Taking the same approach to sourcing and concocting their dog treats that they use for their own diets. The people over at Fido Bones are able to provide Santa Clarita Valley residents with some of the highest quality dog treats available. Committed to bringing their healthy dog treats to as many dog lovers as possible, Fido Bones makes sure to never sell any product they have not given their own pets. “As a pet owner when I go to purchase treats for my pet the first thing that comes to mind is safety for my family member,” said Stephen Crowell, Owner Fido Bones. “I want make sure that the treat that my pet receives will not hurt him.” as a result Stephen and the team over at Fido Bones are dedicated to finding the safest, healthiest, and tastiest dog treats possible. “I tell all my customers the same thing, all bones can splinter you should always keep a watch over your pet when giving them any treat,” Stephen warns pet owners. You can browse the Fido Bones store and select from a wide variety of treats and pet accessories, from beefy sticks, to bully sticks to winter clothes for your dogs there is a bit of everything. Finding just the right products for your family is never easy and when dealing with those family members who can’t speak up for themselves it can become even more challenging. Thankfully, Fido Bones is looking to make it that much easier for you with their wide range of products and tireless sourcing and researching to provide you with the best products available. Choose between chicken chips and knuckle bones for your four legged friends on the Fido Bones website. To learn more about Fido Bones and check out their great portfolio of products visit their website. We hope you can join us at the 2018 KHTS Home and Garden Show at Central Park on April 28th and 29th, 2018 at one of the largest California Home and Garden Shows right here in Santa Clarita! A measles quarantine was ordered Thursday at two public universities in Los Angeles in an effort to try to prevent the spread of the highly contagious disease. Measles cases are at their greatest number in the U.S. since the disease was declared eliminated. CNN's Dr. Sanjay Gupta reports. Nearly two decades after measles was declared eliminated in the United States, the country and the globe have seen an upsurge of cases -- including adults who thought they were protected by the vaccine. Now, some are questioning whether they are properly vaccinated and whether they are still at risk for getting measles. Fainy Sukenik believes in vaccines, and her four children are up to date on all their shots.